Should You Buy Brick or Travertine Coping? There are several great varieties of pool coping that we offer when renovating swimming pools. Two of our most popular types of coping are brick and Travertine. There are plenty of things to like about these materials, but we’d like to highlight a few of the differences that you might care about if you’re making a decision between these options. Brick is more colorful. A number of color options make this the most visually customizable of our coping materials. Match your outdoor setup closely with brick coping to taste. Brick comes in several shapes. To add to your customization options, brick can also be shaped a few different ways. Travertine stays chill to the touch. Avoid scalding your feet on sunny summer days with always-cool Travertine coping. Travertine is naturally non-slip. Put safety first and prevent accidents, as Travertine surface does not get slippery when wet. For more info on our coping materials and options, visit our tile & coping page. Looking to invest in new coping for your pool? Thinking of renovating this season and weighing your various customization options? 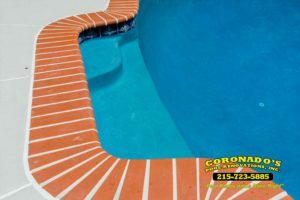 Remember that if you need any help with your pool, and high quality work is a priority for you, Coronado’s is the best around. Get in touch with us today, and we’ll provide you with a quote and estimate free of charge!